The US Department of Agriculture (USDA) has cut its forecast for global wheat production in 2010-11, but by less than expected. The department now predicts total output of 643 million tonnes for the current agricultural year, down from its August forecast of 645.7 million. Analysts had expected an even lower number of 641 million tonnes. But this still means the USDA expects output to fall 5.5% from last year, mainly because of a drought in Russia. 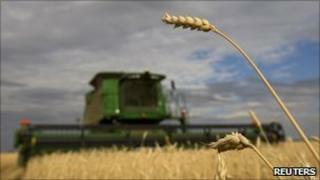 The price of wheat dropped following the release of the forecast. There was more positive news when Ukraine's prime minister, Mykola Azarov, said that the country would not follow Russia in restricting grain exports. On Monday, Russian president Dmitry Medvedev announced that Russia would only lift its grain export ban when it was clear how much had been harvested. Russia, one of the world's biggest producers of wheat, barley and rye, has been hit hard by drought and wildfires. The subsequent export ban caused global wheat prices to rise sharply on the international commodity markets. The USDA report also revised down its 2010-11 forecast for Russia to 42.5 million tonnes, meaning that it now expects a 31% drop in Russian output compared with last year. As a result, Russian wheat inventories are expected to more than halve to below 5 million tonnes by next summer. Ukraine, another huge grain exporter, was considering a ban, forcing several large customers, including Egypt to search for alternative supplies. But Mr Azarov said that despite a long drought, the country had managed to harvest enough grain to meet domestic and export demand. "We do not plan any kind of limits on exports," Mr Azarov told regional officials in the southern Crimea region. The USDA's forecast for global consumption was also revised down slightly - to 661m tonnes - although this still means governments are expected to run down their grain reserves by 9% to meet demand.